Fictional dystopias are, increasingly, boring and lifeless. When so many of the usual concerns of the genre — sexism (The Handmaid’s Tale), anti-intellectualism (Fahrenheit 451), and bread and circuses distraction (The Hunger Games) are so obviously woven into the fabric of everyday life, why even bother? These stories often boil down to either telling us how bad things are (we know), how bad they’re going to get (we know! ), or they pivot into a fantastical, revolutionary narrative (we wish). Enter Psycho-Pass. Psycho-Pass, the 2012 anime series produced by Production I.G. and written by Gen Urobuchi, relies on one of the biggest dystopian tropes of all: unavoidable, near-omnipresent surveillance. The series takes place in a world where Japan is governed entirely by the Sybil System, an enigmatic computer network that constantly observes the populace to gauge their stress level, mood, and general mental health, codified into each person’s “Psycho-Pass.” This data is, in turn, used to determine whether or not a given person will do crimes, measured by a number called a Crime Coefficient. (Think of it this way: If the Crime Coefficient is high, someone’s probably gonna die.) 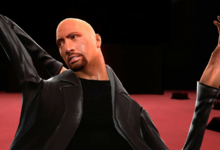 The main characters work for the Public Safety Bureau, which is to say they’re cops in a world where most crime never happens. 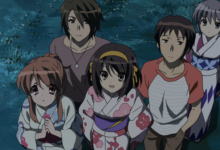 In the first season, the show’s protagonist Akane Tsunemori is a rookie member of the Public Safety Bureau, an Inspector charged with leading a squad of Enforcers — people with high Crime Coefficients who work as attack dogs for the department — to hunt down and subdue criminals both before and after they’ve actually committed the crimes. Her primary subordinate is Shinya Kogami, a cool and collected detective who originally worked as an Inspector until he became too consumed by his work. He and Akane are both pretty standard cop characters at first, which allows the show’s focus to remain largely on the world of Psycho-Pass itself. Putting aside the obvious Minority Report comparisons, to say nothing of real-life attempts at surveillance-based law enforcement phrenology, Psycho-Pass paints a compelling picture of a muted, oppressive world kept in thrall by Sybil. The system decides citizens’ career aptitudes, and sanctions specific types of art and music that will be beneficial to the Psycho-Pass of the general public. Bizarre online subcultures, complete with influencers, exist to occupy people’s time, while the elite are largely concerned with keeping up appearances at old-fashioned finishing schools. And in the same way that the Sybil System allows (or forces) everyone to paper over their own anxiety, stress, and pain, widely-available holographic technology allows even Akane’s dreary, small apartment to look, at least, like a castle. Akane is herself a fish out of water in this world. An incredibly bright, almost impossibly naive young woman, she joins the PSB out of a sense of duty, but discovers quickly that her optimism is unfounded. Beyond the ordinary compromises of being a cop, Akane has to deal with the fact that the “objective” judgments of the Sybil System are often screamingly unjust — in her very first case, a kidnapping victim has an increased Crime Coefficient as a result of the stress and trauma of the incident, and nearly becomes a target for “lethal enforcement.” As the series progresses, Akane learns that simply being around crime is often enough to put someone’s soul in danger. In asking its protagonist to grapple with the dangers of unchecked empathy (or at least of opening yourself up to merely thinking about evil) Psycho-Pass resembles Bryan Fuller’s expressionist murder masterpiece Hannibal. In that series, FBI profiler Will Graham suffers from a personality disorder that allows and sometimes forces him to assume the point of view of the serial killers he tracks down — a common visual device finds the show restaging the crimes Will is trying to solve, with him standing in for the murderer. It’s a clever take on the tired cop trope that only someone who really understands crime is capable of solving it, even if it puts them on the edge: Will’s emotional porousness makes him a valuable resource to the FBI, but it also opens him up to manipulation by his therapist, Hannibal Lecter. 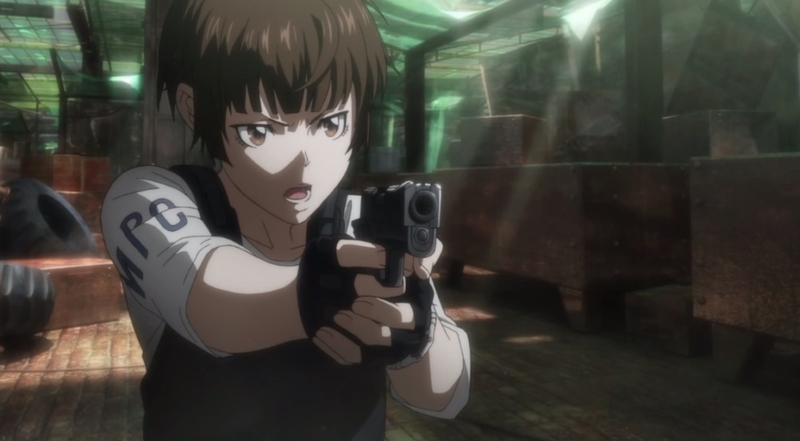 Psycho-Pass’ connections to Hannibal don’t end there: Both shows are aggressively literary, full of purple dialogue in which characters debate the pros and cons of different approaches to life. In Hannibal, this takes the form of elaborate speeches about aesthetics, ethics, and truth; in Psycho-Pass, arguments about the comparative benefits of Rousseau and Foucault. The commitment to a degree of almost parodic ideological debate largely comes from both series’ villains, who are in turn remarkably similar. Shogo Makishima, the mastermind behind most of the crimes in Psycho-Pass, is eerily reminiscent of Mads Mikkelsen’s Hannibal Lecter, a charismatic, light-haired monster with lofty ideals who doesn’t flaunt society’s rules as much as he lives flagrantly above them. In fact, Makishima’s Crime Coefficient is negligible; for whatever reason he does not act as if he’s doing anything wrong at all. Like Hannibal, Makishima is a master at convincing other people to serve his ends while retaining a strong, visible baseline of contempt. Like Hannibal, Makishima often treats his crimes like works of art, serving to make a broader statement about values and the ideal society. 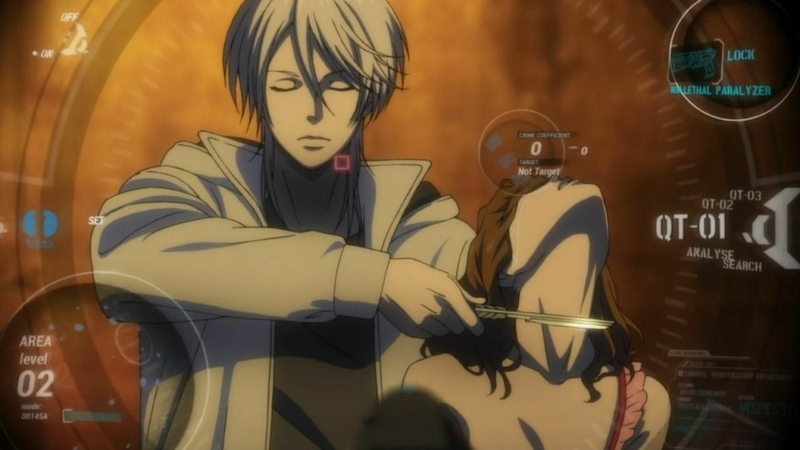 (One of Makishima’s minions is a failed artist who tries in vain to say something with her murders; when Hannibal observes a mural of an eye made out of human bodies, he genially tells the killer, “I love your work.”) And, like Hannibal, Makishima becomes obsessed with the officer pursuing him — in this case Kogami. In many, if not most, stories like this one, the hero would be either Makishima or Kogami — the idealistic revolutionary intent on bringing down an oppressive system, or the single-minded cop tasked with taking down a terrorist. Instead, Psycho-Pass’ true protagonist is Akane, a woman who has begrudgingly committed herself to the rule of law and responds to both Kogami and Makishima with varying degrees of indignation and horror. She’s not the rogue cop with a hunch, she’s the captain telling that guy to turn in his badge. Not because she’s an infuriating stickler for the rules — or rather, not just because of that — but out of a sense of concern for Kogami’s well-being, and for the team’s ability to continue maintaining order. Beyond the problems she encounters in the day-to-day maintenance of the rules, Akane eventually learns the true nature of the Sybil System: It’s a literal neural network, a series of interconnected brains that processes all of the data from scanners and renders judgment. 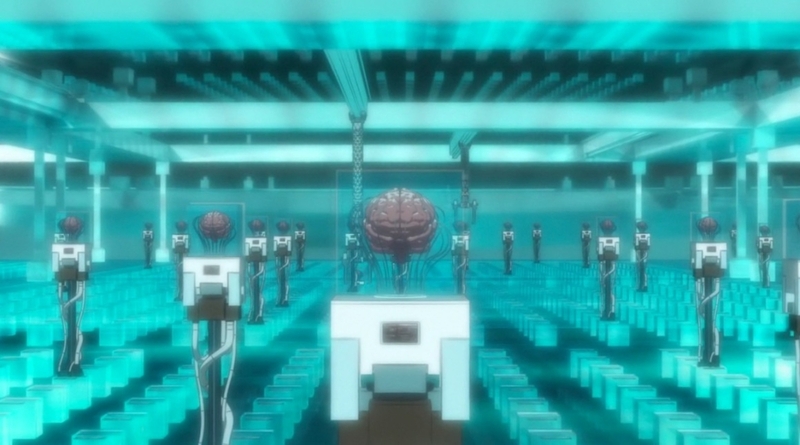 All of these brains are harvested from people who, like Makishima, are functionally sociopathic, incapable of being judging by the system as a whole. Kasei, the chief of the PSB and Akane’s superior, is a cyborg occupied by one such brain at a time, allowing the system direct eyes and ears in the department. Faced with government by body horror, Akane does what many, if not most of us would do: she compromises with the system. Asked to bring Makishima in alive so that his brain can be added to the Sybil System, she agrees — on the condition that Kogami be pardoned. (By this point in the story, Kogami has gone on the lam to try and kill Makishima, because he has to bring the mastermind down. You’re not surprised, are you?) And when that plan doesn’t work and Kogami does kill Makishima, she resigns herself to her role in society and goes back to work. Akane finds herself caught between a set of unstoppable forces, immovable objects, and irritating men: Makishima is essentially correct about Sybil, but wants to bring it down through an act of mass bioterrorism. Kogami chooses to go vigilante in the interest of capturing his prey, with little care for improving the lives of Japanese citizens. And the Sybil System wants to maintain its own grip on society, neutralizing both criminal and investigator alike. 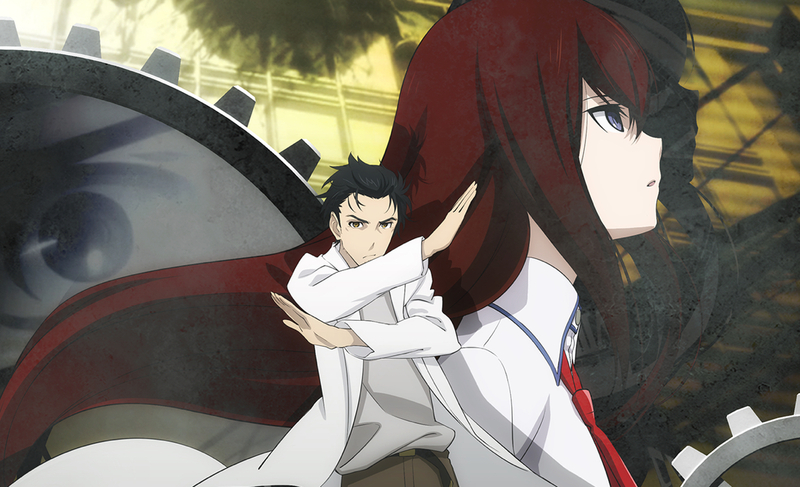 Trapped in the middle of this conflict, Akane opts out. There are all sorts of powerful, climactic moments toward the end of the first season of Psycho-Pass: Makishima and Kogami’s final showdown, the death of one of the members of the PSB, the realization that an Inspector’s Crime Coefficient has gone too high, dooming him to life as an Enforcer. But the ideological culmination of the season is, first, Akane’s agreement with the Sybil System, and then their final debrief after Makishima’s death. Somehow, a scene that’s just a woman talking to a brain manages to feel just as gripping as a shootout. Putting aside whether this will annoy my anarchist friends, Akane’s commitment to law and order in the face of insanity is fascinating. Sybil’s goal is to eventually reveal its true form and identity, allowing the public to choose to live under its rule. Swaying Akane to accept the system becomes its project, making her, in essence, the trial subject for ethical authoritarianism. The system allows her to continue working as a cop, trusting, correctly, in her “respect for the law.” Her resistance to the system has been co-opted as a new form of control. Though Akane powerfully asserts, backed by the gentle lilt of piano keys, that “Someone will come to this room someday to turn off the power,” it won’t be her — and she probably won’t like what they had to do to get there. Effective pessimistic, dystopian storytelling works by leading the audience to recognize a hard boundary, to see the structures that govern the world outside of the protagonist’s ability to manage. Usually, that creates a definitive narrative stopping point: simply continuing to exist in a broken society with no recourse to change anything is too overwhelming and horrible. The protagonist is broken, or else the world is. Psycho-Pass is aware of this history — in one scene, Makishima literally debates which literary dystopia most resembles the world of the Sybil System. But TV, with its need for ongoing, serialized narrative, is inherently at odds with this kind of finality. And the cop-serial killer drama, with its intense focus on an individual relationship to the exclusion of most of a broader society, frequently can’t handle the weight of the statement an effective dystopia makes. This is to say that, like many dystopian TV shows (looking at you, The Handmaid’s Tale), Psycho-Pass didn’t know when to let go. 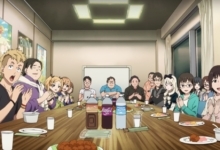 The second season finds Akane running through another mysterious case that feels like Makishima with a change of voice and hair color, while the just-announced third season seems like it will largely feature new characters coming to the same set of conclusions. I’m excited to watch it, but I’m not sure I have the highest expectations. 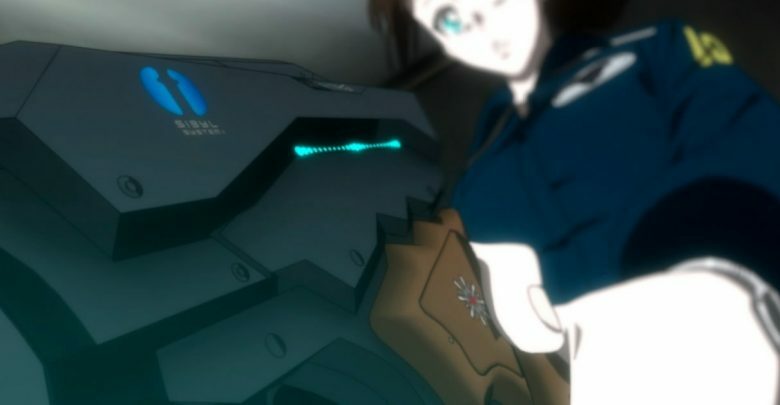 The first season of Psycho-Pass led its hero to a moment of profound realization about the brokenness of her world, and, fueled by misplaced idealism, forced her to flinch. I’m not sure anything else set in that world — or this one — will top that.